Mechanic's Assistant: Do you know your ignition timing number? How many miles are on the car? Mechanic's Assistant: What is the model of your '04 Isuzu? Hello, do you have the vehicle's vin number? Are you looking for the timing marks only? That is the only info that shows under the VIN provided. I will opt out and let another expert assist you. The diagram supplied above should be correct. Was this engine running prior to removing the belt, or broken belt? There is a gear ratio within each head, the cams also have timing marks with the front pulleys. Each head has 1 in 4 chance of being correct. Have you rotated either cam pulley from where it was? The ratio from crank to cam pulley is 1.5:1. The ratio within the heads is 1.3333:1, hence total of 2:1. If you have rotated the pulleys and don't know where you are now, the valve covers need to come off to verify the cam timing dots on the internal gears. Are you using a genuine belt with the marks on the back of the belt? NO, HAVE VALVE COVERS OFF I SEE DOTS ARE LINED UP BACK OF BOTH GEARS HOW MANY TIMES DO I ROTATE TO CHECK LINES AGAIN BECAUSE OUTER PULLEY MARK ON DRIVERS SIDE ARE NOT ALIGNED PASSEGER SIDE IS ALIGNED CRANK ALIGNED BACK OF CAMS DOTS ALIGNED ALL DATA SHOES PASSEGER CAM ONLY AND UPPER PICTURE IN ALLDATA SHOWS BOTH AT TOP TO MARKS ON VALVE COVER? If all the marks are lined up, then you need to rotate the crank 6 laps for all the marks to be aligned again, not 2 rotations like a normal 4 stroke. I've looked at the drawing again above, I think that is 6VD1 not 6VE1. Does yours have three gears in each head as a reduction gearset? Perhaps you need this drawing? 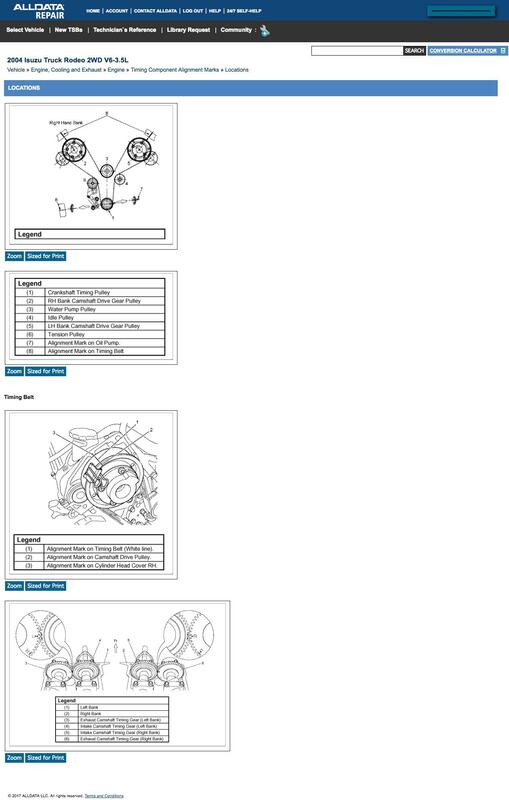 So which drawing above do you think is correct for your engine? Our Australian 6ve1 is the second drawing I have supplied. Does it feel like valves are kissing pistons? There are two sets of marks for the crankshaft. One aligns the pulley to the timing case. One notch for the belt dotted line. And where have you got the belt dotted line? On the other side where the pulley notch is? You need to have a belt with 2 solid lines for the cams, and 1 dotted line for the crank. Ok, I'll leave it with you for now. Was the cam pulley bolt tight enough? Dowels will shear if the cam pulley bolts come loose. All the best to you for a speedy repair.